Net sales: MSEK 582 (503) – up 11% y-o-y, after adjusting for currency (+5%). Operating income: MSEK 140 (108), generating an operating margin of 24.1% (21.4). Underlying operating margin was 24.8% (19.6), adjusting for end of customer contract terms and pension related items affecting comparability. Earnings after tax: MSEK 115 (82); basic EPS of SEK 2.95 (2.08). Strong cash flow generated from operating activities: MSEK 136 (132) driven by management of working capital. Dividend: Based on the Group’s earnings and strong financial position, the Board of Directors intend to propose a total dividend of SEK 4.25 (3.75) per share and to renew the current mandate for share buybacks. Net sales: MSEK 2,410 (2,104) – up 12% y-o-y, after adjusting for currency (+3%). Operating income: MSEK 529 (404), generating an operating margin of 21.9% (19.2). Underlying operating margin was 22.1% (18.7), adjusting for end of customer contract terms and pension related items affecting comparability. Earnings after tax: MSEK 405 (303); basic EPS of SEK 10.30 (7.54). Strong cash flow generated from operating activities: MSEK 554 (360) driven by management of working capital. Group’s net debt: MSEK 12 (185); gearing ratio of 1% (21). President and CEO, David Woolley, comments on Q4 2018 interim report. Group sales for the fourth quarter were up year-on-year by 11% in constant currency and were well ahead of the published market indices. The continued strong demand is evident in both of our core regions, North America and Europe, as well as in all four sectors we serve, most notably truck and equipment for construction and agriculture. Comparing full year 2018 against 2017, our group sales were up by 12% in constant currency, exceeding the published indices by 5 percentage points. The largest end sector for Concentric continued to be trucks, representing 45% of the group’s sales, concentrated primarily in North America and Europe. The North American economy in particular, is driving the strong year-on-year growth in the medium- and heavy-duty truck market. In the same sector, European demand showed steady growth but not to the extent experienced in 2017. The end sectors of construction equipment and agricultural machinery also showed improvement in all geographical areas, whilst industrial applications experienced steady year-on-year growth, principally in North America, Europe and India. In particular India has been a strong market in 2018 as the economy has continued to grow aided by stable government policies and continued infrastructure investment. Concentric has seen strengthening in all four-end market applications, but this has been particularly strong in the medium- and heavy-duty Truck and construction equipment sectors. The culture within Concentric to achieve continuous improvement is firmly embedded. The key driver is to achieve absolute satisfaction of our customers and employees. The Concentric Business Excellence programme (“CBE”) has enabled the teams to efficiently increase our capacity and output across the globe to meet the growing demand. The CBE-programme has continued to improve the group’s profitability and the reported operating margin for the fourth quarter and the full year increased to 24.1% (21.4) and 21.9% (19.2) respectively. The year-on-year operating income drop through for the fourth quarter and the full year was just over 40%. Following the decision by a global customer to dual source components there has been a gain in the fourth quarter associated with end of contract terms, which amounts to MSEK 29. However, there have also been pension costs of MSEK 25 following a recent ruling in the British courts equalising historical pension benefits between men and women. The net gain from these items is MSEK 4 and the underlying operating margin before items affecting comparability is 22.1% (18.7) for the full year. We are continuously investigating potential acquisitions that will offer either geographical expansion, product expansion into the growing electrification market or enabling technologies that will enhance our current engine and hydraulic product lines to provide us with an even greater presence alongside our global customers. The Chinese air quality improvement plan covers many emission sources, where heavy-duty trucks are one important subset. The China-6 legislation is similar to Euro VI and will become effective in China’s largest cities as of July 1, 2019 and this is ultimately expected to result in the replacement of one million heavy-duty trucks. Globally, the Alfdex-separator is the most widely used solution for active cleaning of crankcase gases in truck engines and has the potential to be a critical component in achieving China-6 regulations. It was launched in 2004 and has been selected by truck manufactures in North America, Europe and Japan. Alfdex has recently received its first orders from OEM’s in China, whereof one is from Weichai, which is the largest engine manufacturer in China, who also manufactures heavy trucks. This represents a significant breakthrough into the China medium- and heavy-duty truck market. The order is exciting as Weichai is one of the major players and technology leaders in the Chinese truck market. The overall published market indices blended to Concentric’s mix of end market applications and locations has grown year on-year by 7%. 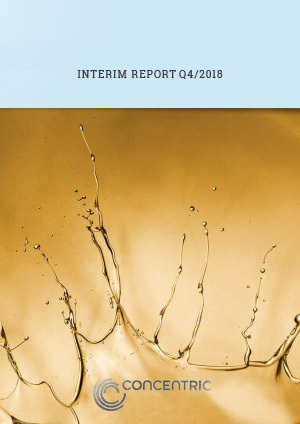 The seasonality effect makes it difficult to assess whether the market has reached a sustained high, particularly the truck market in North America and Europe, but the fourth quarter's published market data shows there has been further growth in our core markets, albeit at a slower rate than previously experienced this year. The sales order bank remains strong. Orders received in the fourth quarter indicate that sales in the first quarter 2019, will remain at a similar level after adjusting for more working days. The first quarter's sales will also be affected by the previously announced decision by a global customer to dual source components. As we look further into the coming year, the emerging markets offer strong growth potential in the construction equipment and agricultural machinery sectors but their medium- and heavy-duty truck sectors could see negative growth. The North America and European markets are expected to offer flat to single digit growth as the markets hold at current levels. We have a great team in place that are highly motivated and look forward to the opportunities and challenges of 2019. Concentric remains well positioned both financially and operationally, to fully leverage our market opportunities. The information in this report is of the type that Concentric AB is obliged to make public pursuant to the EU Market Abuse Regulation and the Securities Markets Act. The information was submitted for publication, through the agency of the contact persons set out above, at 08.00 CET on 6 February, 2019. Nettoomsättning: 582 MSEK (503) – upp 11% jämfört med föregående år efter justering för valuta (+5%). Rörelseresultat: 140 MSEK (108) – en rörelsemarginal om 24,1% (21,4). Den underliggande rörelsemarginalen var 24,8% (19,6), justerat för utfasning av kundkontrakt och jämförelsestörande pensionsrelaterade poster. Resultat efter skatt: 115 MSEK (82); resultat per aktie före utspädning om 2,95 SEK (2,08). Starkt kassaflöde från den löpande verksamheten: 136 MSEK (132), som ett resultat av hanteringen av rörelsekapitalet. Utdelning: Mot bakgrund av koncernens resultat och starka finansiella ställning kommer styrelsen att föreslå en utdelning om 4,25 SEK (3,75) per aktie och att nuvarande mandat för återköp av egna aktier förnyas. Nettoomsättning: 2 410 MSEK (2 104) – upp 12% jämfört med föregående år efter justering för valuta (+3%). Rörelseresultat: 529 MSEK (404) - en rörelsemarginal om 21,9% (19,2). Den underliggande rörelsemarginalen var 22,1% (18,7), justerat för utfasning av kundkontrakt och jämförelsestörande pensionsrelaterade poster. Resultat efter skatt: 405 MSEK (303); resultat per aktie före utspädning om 10,30 SEK (7,54). Starkt kassaflöde från den löpande verksamheten: 554 MSEK (360), som ett resultat av hanteringen av rörelsekapitalet. Koncernens nettoskuld: 12 MSEK (185); en skuldsättningsgrad om 1% (21). VD och koncernchef, David Woolley, kommenterar bokslutskommunikén för fjärde kvartalet 2018. Koncernens omsättning för fjärde kvartalet ökade med 11% justerat för valuta jämfört med föregående år, vilket är betydligt högre än den publicerade marknadsstatistiken. Den fortsatt starka efterfrågan är uppenbar i våra båda kärnregioner, Nordamerika och Europa, samt på alla våra fyra slutmarknader, i synnerhet lastbilar och utrustning för entreprenad och lantbruk. Om helåret 2018 jämförs med 2017, så ökade koncernens försäljning med 12% justerat för valuta och överträffade den publicerade marknadsstatistiken med 5 procentenheter. Den största slutmarknaden för Concentric är fortfarande lastbilar, som svarar för 45% av koncernens omsättning, främst koncentrerat till Nordamerika och Europa. Det är i synnerhet den nordamerikanska ekonomin som driver den starka tillväxten jämfört med föregående år inom marknaden för medeltunga och tunga lastbilar. Även efterfrågan på lastbilar i Europa visade tillväxt men inte i den utsträckning som rådde under 2017. Slutmarknaderna för entreprenadmaskiner och jordbruksmaskiner visade också förbättringar på samtliga geografiska områden och industriapplikationer hade en stadig tillväxt jämfört med föregående år, främst i Nordamerika, Europa och Indien. I synnerhet Indien har varit en stark marknad under 2018 eftersom ekonomin har fortsatt växa, med stöd av en reformagenda och fortsatta investeringar i infrastruktur. Concentric har blivit starkare inom alla fyra slutmarknader, särskilt inom marknaderna för medeltunga och tunga lastbilar och entreprenadmaskiner. Concentrics strävan efter kontinuerliga förbättringar är en självklar, integrerad del av vår företagskultur. Den viktigaste drivkraften är att uppnå högsta möjliga nöjdhet bland våra kunder och anställda. Concentrics program för Business Excellence (”CBE”) har hjälpt våra team att på ett effektivt sätt öka vår kapacitet och produktion över hela världen. På så sätt har vi varit bättre rustade att möta en ökad efterfrågan. CBE fortsätter att bidra till ökad lönsamhet inom koncernen och den redovisade rörelsemarginalen för det fjärde kvartalet och helåret ökade till 24,1% (21,4) respektive 21,9% (19,2). Bidragsmarginalen på ökningen av rörelseresultatet för fjärde kvartalet och helåret jämfört med föregående år uppgick till drygt 40%. Efter att en global kund beslutat att använda två leverantörer för komponentinköp uppstod en vinst om 29 MSEK för det fjärde kvartalet, kopplat till utfasningen av kontraktet. Samtidigt redovisades en pensionskostnad om 25 MSEK efter en nyligen fastställd dom i brittisk domstol där historiska pensionsförmåner jämställs mellan män och kvinnor. Nettovinsten från dessa poster blev alltså 4 MSEK och den underliggande rörelsemarginalen före jämförelsestörande poster för helåret blev 22,1% (18,7). Vi undersöker kontinuerligt potentiella förvärv som antingen möjliggör geografisk expansion, produkter på den växande elektrifieringsmarknaden eller teknik som stärker våra befintliga produktlinjer inom motorer och hydraulik, så att vi stärker vår globala position bland våra kunder. Ambitionen i Kina att förbättra luftkvaliteten omfattar många utsläppskällor, där tunga lastbilar utgör en viktig del. Lagstiftningen China-6 liknar Euro VI och träder i kraft i Kinas största städer den 1 juli 2019. Detta förväntas i det långa loppet leda till att en miljon tunga lastbilar byts ut. Globalt är Alfdex-separatorn den mest använda lösningen för aktiv rening av vevhusgaser i lastbilsmotorer, och har potential att bli en kritisk komponent i att uppfylla China 6-regleringen. Den lanserades 2004 och har blivit den etablerade lösningen för de flesta lastbilstillverkarna i Nordamerika, Europa och Japan. Alfdex fick nyligen sina första ordrar från tillverkare i Kina. En order är från Weichai, som är den största motortillverkaren i Kina och som även tillverkar tunga lastbilar. Det utgör ett betydande genombrott på den kinesiska marknaden för medeltunga och tunga lastbilar. Det är en viktig order eftersom Weichai är en av de stora aktörerna och teknikledarna på den kinesiska lastbilsmarknaden. Den publicerade marknadsstatistiken, viktad för Concentrics mix av slutmarknader och geografisk närvaro, har vuxit med 7% jämfört med föregående år. Säsongsvariationen gör det svårt att bedöma om marknaden har uppnått en topp, i synnerhet lastbilsmarknaden i Nordamerika och Europa, men publicerade marknadsdata för fjärde kvartalet visar att tillväxten på våra kärnmarknader har fortsatt men tillväxttakten är lägre än vad vi sett tidigare under året. Orderboken är fortsatt stark. Orderingången under fjärde kvartalet tyder på att omsättningen under första kvartalet 2019 kommer att kvarstå på ungefär samma nivå, efter justering för fler arbetsdagar. Försäljningen i första kvartalet kommer också att påverkas av effekten av att en global kund beslutat använda två leverantörer. I vår prognos för det kommande året bedömer vi att tillväxtmarknaderna har stor potential inom marknaderna för entreprenadmaskiner och jordbruksmaskiner, medan marknaderna för medeltunga och tunga lastbilar kan se negativ tillväxt. De nordamerikanska och europeiska marknaderna förväntas ge oförändrad eller ensiffrig tillväxt. Vi har ett fantastiskt motiverat team och vi ser fram emot att möta de möjligheter och utmaningar som 2019 har att erbjuda. Concentric är fortsatt välpositionerat, både finansiellt och operationellt, för att kunna realisera vår marknadspotential. Informationen i denna rapport är sådan som Concentric AB är skyldig att offentliggöra enligt EU:s marknadsmissbruksförordning och lagen om värdepappersmarknaden. Informationen lämnades, genom ovanstående kontaktpersoners försorg, för offentliggörande den 6 februari 2019 klockan 08:00 CET.